Today, we’ve launched a review into how North East businesses rate their business banking. Working with the North East England Chamber of Commerce we’re calling on all businesses throughout the region to share their experiences to help deliver a valuable and representative snapshot of businesses’ financial experiences. The survey will also uncover how businesses are feeling about the impact of Brexit on the financial services they rely upon. The aim of the business banking pulse is to identify where banks can improve what they offer in areas such as access to capital, account fees and relationship management. We’ll also aim to highlight any innovative practices we find and to learn more about how businesses are making use of new business-focused FinTech firms. Mike Fotis, founder, Smart Money People said: “Business banking has traditionally been a source of frustration for many businesses – big and small. On a national level, it is consistently one of the poorest performing products for customer satisfaction on our site. Working with the Chamber, we’re keen to find out more about the experiences of businesses in the region, and to use the insight gained to help drive change. Ben Powick, policy adviser, the Chamber said: “Our Manifesto pledges to raise awareness of business finance options in the region. The second annual Business Banking Pulse survey will give us a good insight into how the banking sector is responding to the needs of business, thereby giving us a chance to see at any opportunities for improvement. 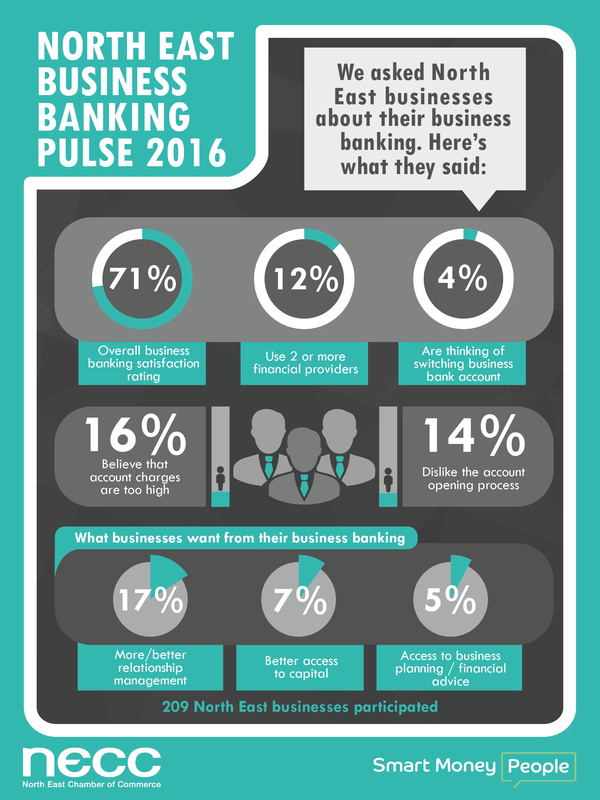 The North East Business Banking Pulse will run from Monday 16th January to Friday 17th February and is open to businesses of all sizes. The results will be published in March.